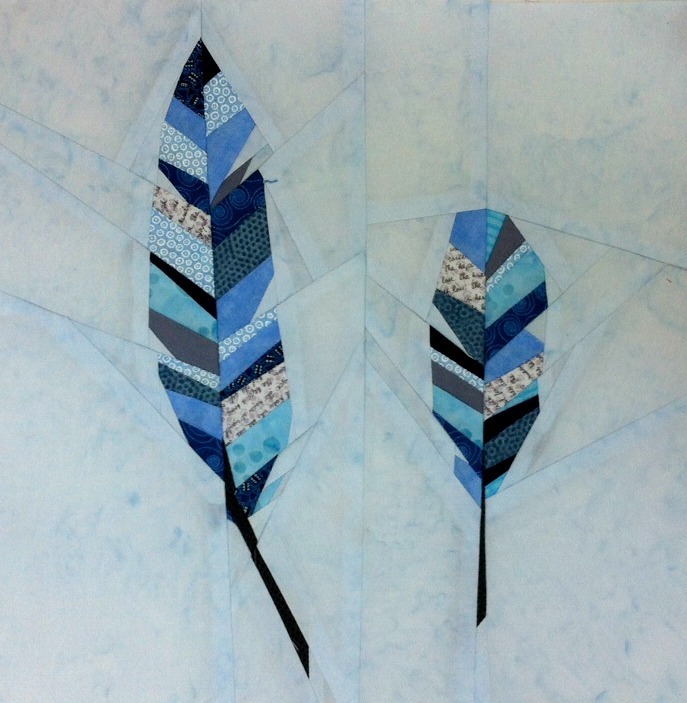 I have been participating in the Forest Quilt-Along, which is being hosted by two very talented paper-piecing artists in Poland. I am about a month behind the group so I am playing catch up. This is block 3 – Aspen Grove. 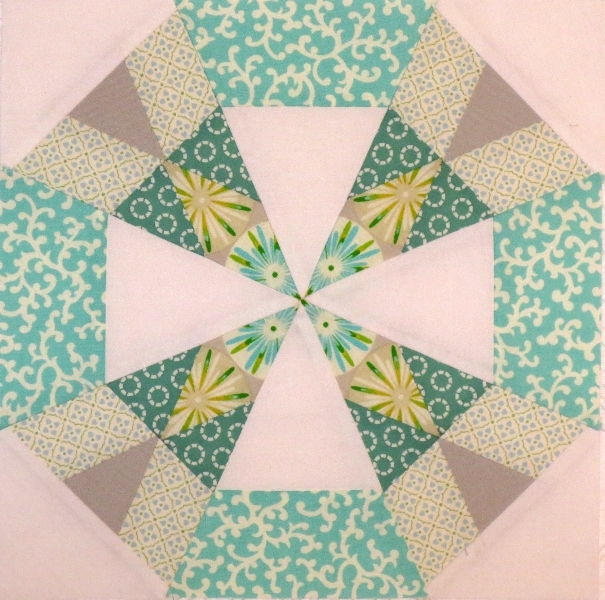 This block was designed by Carolyn of Trillium Designs. As its name suggests, this is an abstract of a grove of aspen trees. 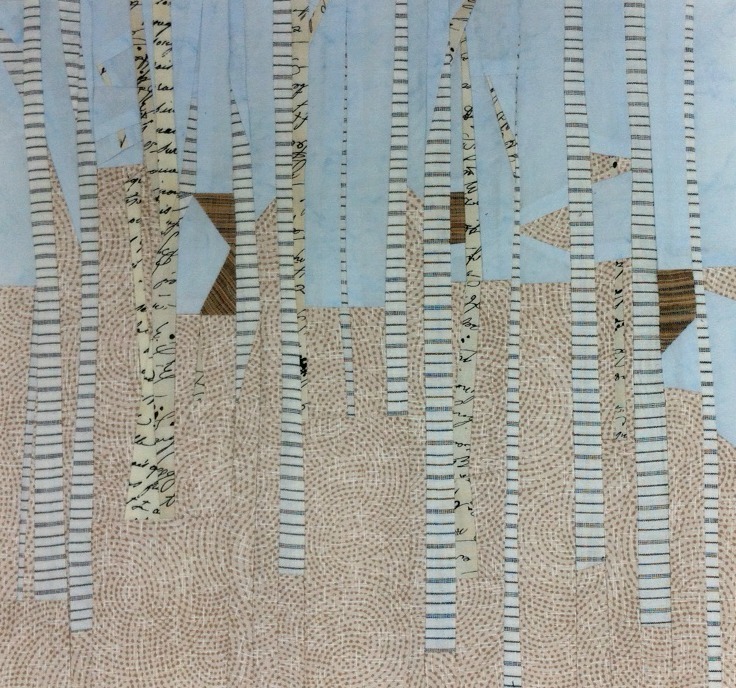 I didn’t have enough of the text fabric to do all the trees, so I used a black and white stripe for some of the aspens. This is a straight forward design with lots of straight lines, but I had to rip a number of seams until I got all the strips sewn in the right order. I think it is a fun and interesting addition to the forest, and I am looking forward to moving on to the next block, which is adorable. If you would like to try this block for yourself, the pattern and instructions can be found at Forest Quilt-Along. While you are there, check out the photo stream of the other blocks. This is the second block in the Forest Quilt-Along being hosted by Polish quilters, Joann at Shape Moth, and Julianna at Sewing Under Rainbow. This particular block was drawn by Joann. Both of these artists do an amazing job of figuring out how to draw complicated paper-pieced blocks. 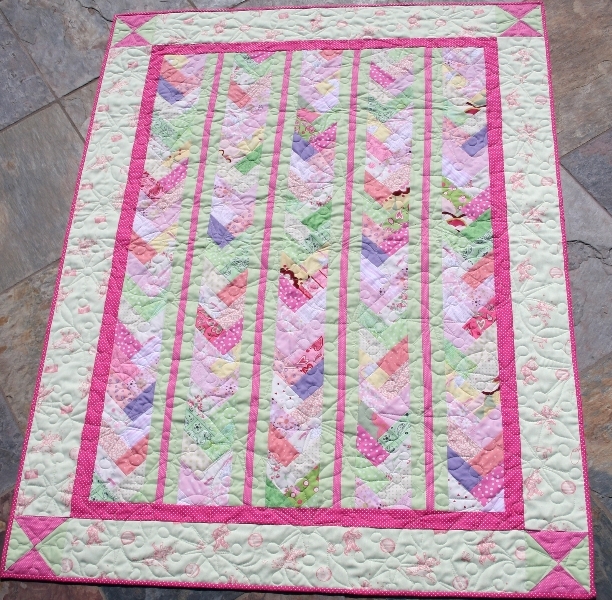 Joann has an interest in birds, as well as a deep interest in Native American culture, so this block is a natural extension of those interests. If you would be interested in giving this block a try, the tutorial can be found at Shape Moth. 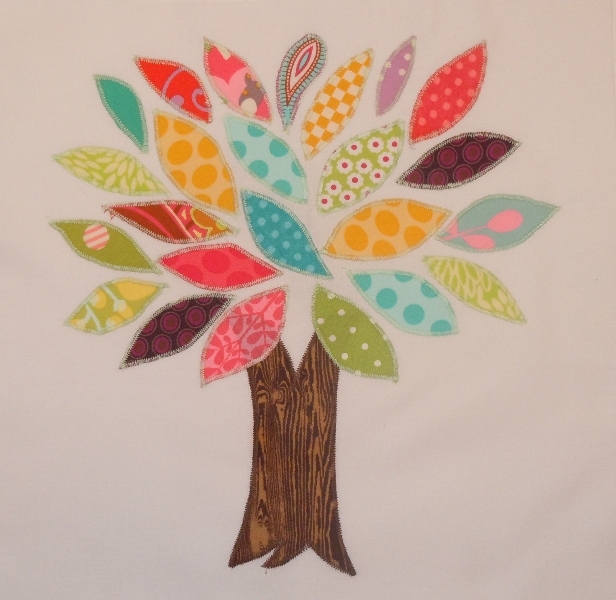 Visit the Forest Quilt-Along Flickr group to see photos of the amazing blocks being made. 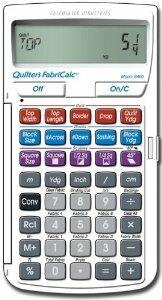 My paper-piecing skills were put to the test today when I started the first block in a Quilt-Along I saw on the internet last week. 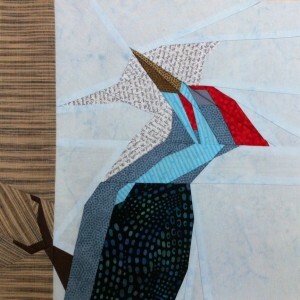 This is the first block – a Woodpecker. Heart and Soul, and a Folded Star! 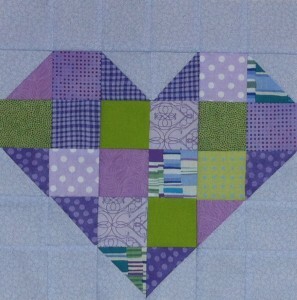 If you would like to make this block, here is the link to the pattern: http://auribuzz.files.wordpress.com/2013/03/heart-and-soul_.pdf, and if you want to be inspired while sewing it, here is the link to the music: http://www.youtube.com/watch?v=SwrYMWoqg5w. 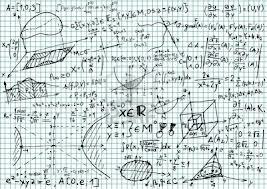 It never fails to amaze me how many uses there are for half-square triangles. This is a very simple, but fun block. 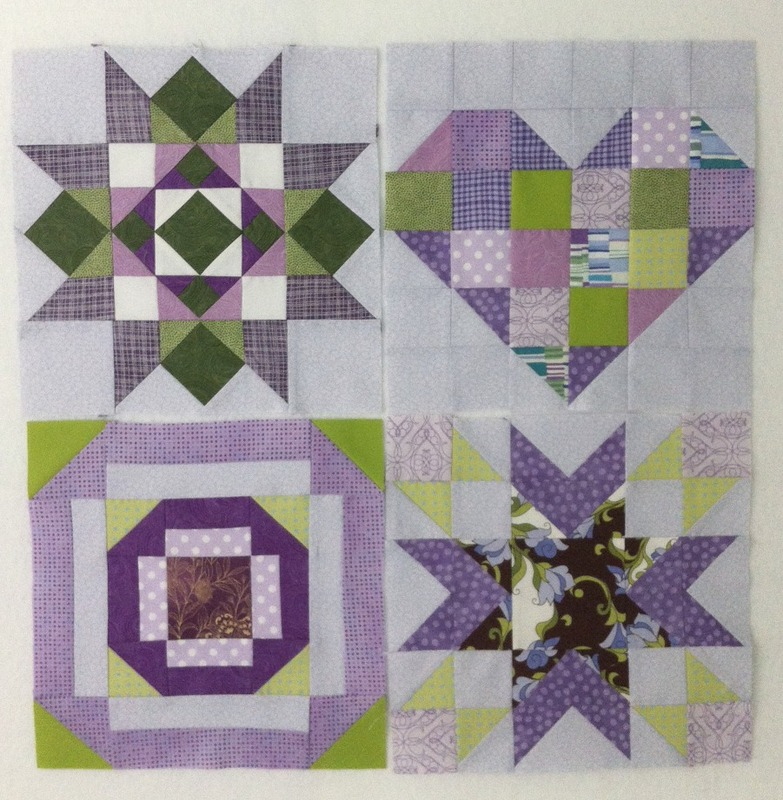 These blocks are so different in design, which makes this project fun and will produce an interesting quilt. 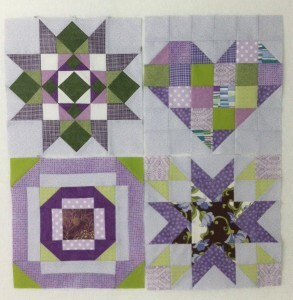 My next project was making a block for Leona (OneyGirl at Flickr) in the Quilt Around the World Bee. 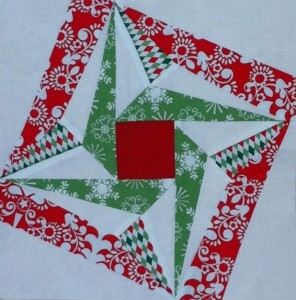 Leona asked us to make her a 12 inch block using modern Christmas themed fabrics. 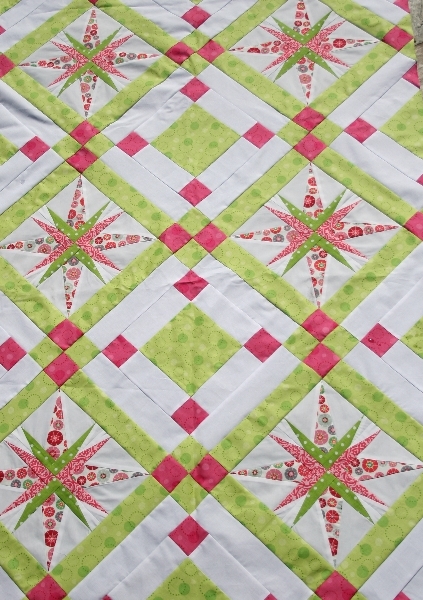 The block I chose for her is called “Folded Star.” It looks a little like a snowflake to me. Okay, a square snowflake. It has a few in-set seams but went together easily. I hope she will like it. It’s nice to get these done, because I have a new project that just hit the table! 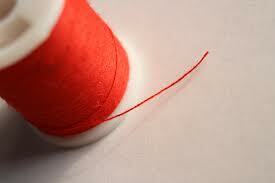 Do you know why we buy this thread? It’s pretty. We gaze at the shimmery colors and imagine all the wonderful embellishments we can make on our next quilt using this beautiful thread. 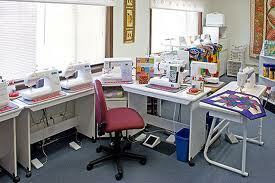 We take it home, thread it through the sewing machine, and then the trouble starts. The thread frays. The thread breaks. It gets snagged in the thread path of the machine. So what is the secret to making this thread behave? When you find a metallic thread you like, unroll approximately 12 inches of the thread from the spool and let it dangle. Does it hang fairly straight, with just the slightest bend in it? That’s a good sign. Does it hang in coils and will not relax? That’s a bad sign. 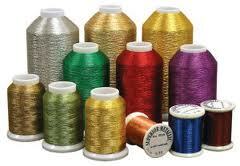 Metallic threads that are wound on tiny spools tend to coil and will not relax. This means the thread is going to twist while it runs through the thread path of the machine and will likely break before it gets to the needle. Look for metallic thread that is wound on larger spools and that hangs fairly straight when unrolled from the spool. 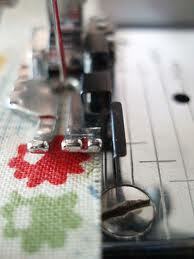 The best needle for metallic threads is a size 90/14 Topstitch Needle. 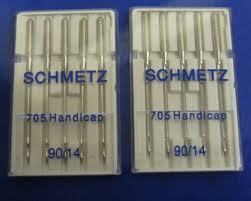 These needles are easy to find and fit almost any sewing machine. They have a larger, elongated eye and have an extra deep groove in the needle shaft that allows the thread to travel down and through the needle more easily, preventing fraying and breaking. 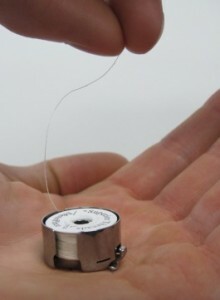 When you are using a metallic thread on the top of the machine, use a 60-weight thread in the bobbin. This thread is slightly thinner than a standard 50-weight piecing thread so it will be less bulky when catching the metallic thread and holding it to the surface of the stitch. Decrease your top tension. 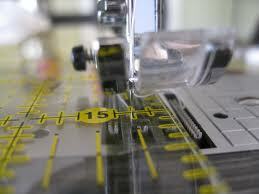 When you decrease the top tension, you are widening the space between the two tension plates in the sewing machine. This allows more space for the thread to travel through and puts less tension on the thread itself. Metallic threads are made by wrapping microscopically thin sheets of aluminum around a cotton core. If too much tension is placed on the metal, it will start to unwrap from the core and fray, and then break. 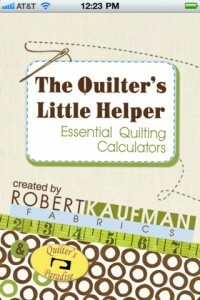 If you have tried all of the above steps and the thread still appears to be too tight going through the needle, skip the last thread guide (the one closest to the needle). This will frequently take just enough tension off the thread for it to relax and run through the needle successfully. 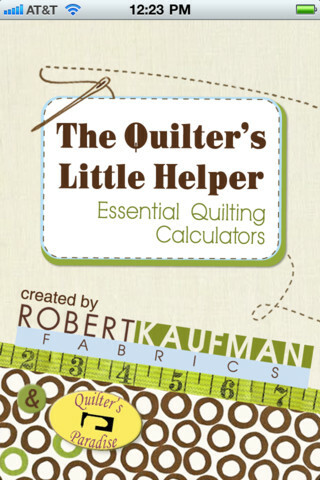 Avoid the frustrations that can occur when using metallic threads by making some simple adjustments to your sewing machine, using the right needle and the right thread in your bobbin.